Track rod with ball joint at the outher side and elastomer joint at the inner side. Delivery pre-installed inclusive connection element, nut right- / left tap and locking plates. Track rod fit to all Trabant 500,600 und 601 types without vintage limit. One side with tap connection, left tap M14x1,5. The elastomer joint is complete and will be mounted at the steering column side. The spare part is made in Germany and will be the best exchange to to original ball joints. Track-rod end for the Trabant. Two pieces will be needed for each car. replacement sleeve for ball joint. Fit to Trabant601, Trabant 1,1 and Wartburg 353 and 1,3. Castle nut for the original track-rod ends. Secure pin for the castle nut original track-rod ends. Security nut for the original track-rod ends. 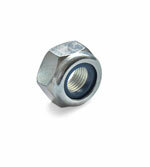 Security nut only use for the new produced (made in EU) track-rod ends.